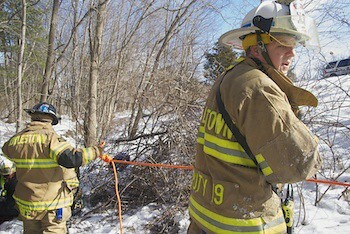 On Feb. 9 at 10:44 am, Doylestown Fire Company and Central Bucks Ambulance were dispatched to a vehicle rescue, with the report of a car into a creek, on the Rt. 202 bypass in the area of South Main St.. Police units from Doylestown Borough and Township, along with Chief Denny Loux, looked for and found the vehicle off the side of the highway on the southbound side just north of Pebble Hill Road. The driver, the sole occupant of the vehicle, was in and out of consciousness and airbags had deployed. Rescue 19 and Engine 79 arrived on scene and assisted Medics from CB Ambulance in removing, packaging and transporting the driver to an ambulance. 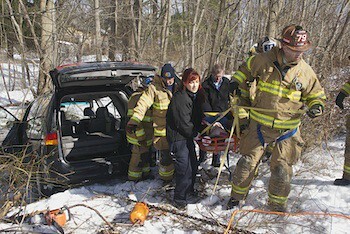 Cold conditions and snow made the trek up the hilly side of the road tricky, but the operation was successful.